Note: The death of my older brother seems to fit with this Daily Om. I receive something different every day and this is a recent one. It is reprinted with permission from Daily Om (See below). While it is about aging parents, many of the sentiments expressed here may prompt you to think about your own aging and the loss of close family members, such as, in my case, older siblings. Dealing with an aging parent is part of the challenges and blessings that are part of the cycle of life. For most of us a natural part of the cycle of life is when our roles as children start to shift from that into caretaking roles where are parents are concerned. This can be as major moving a parent into a retirement facility, or coming to the realization that it’s necessary to check in with them more often than usual. Whatever the case, such a shift is momentous as it signals a time of confronting our own mortality as we confront that of our parents. In addition, it can bring up issues about how well they cared for us when we were young. We may also find ourselves consumed with fear at the thought of losing them, even if we’ve been on our own for a very long time. Talking to other friends and family who are going through similar experiences can be a large source of support. They can help us look at both the unresolved past and the unfolding present, and we are free to talk only about ourselves. Sometimes we need the kind of undivided attention a friend can offer in order to deal with the material that comes up at this time of our lives. In many ways, this time of life signals a rebirth as we examine our individual past, as well as our familial past. As our parents’ lives move toward completion, we are able to see what they did with their time on earth, what we have done so far with our time, and what we might want to do with the time we have left. These challenges and blessings are all part of the cycle of life. I posted this Daily Om before I left for California. I am writing this from California with the help and advice of my daughter-in-law Maura. She suggests that I post all new content on my Home Page and also in my categories. Thus, every time you log into menupause.info, new articles will be featured chronologically. If you subscribe you are getting a ping each time I post, but if you are new to my website, you will see all te new posts each time you log in. This will go into effect when I return to PA on March 1st. Updates as I develop this new way of posting. Note: As a child, I loved to color and when I became a mother, I returned to my joy of coloring with my children. I especially loved to color with them on rainy days. I also grew up loving to rhyme and still put many of my thoughts into rhyme. So Bonnie’s book really resonates with me. Bonnie Gordon-Lucas has combined my love of coloring books and rhyming words into a children’s coloring book about groups of animals and people with short rhymes to accompany the wonderfully whimsical illustrations. She focuses on the actual collective names of animals. For example, a pride of lions is the accepted term to use a group of lions, but the author uses the less-known collective noun “cloud” for her Cloud of Bats page. While the coloring book is whimsical, it is also a teaching tool about animals, rhyming, and art. 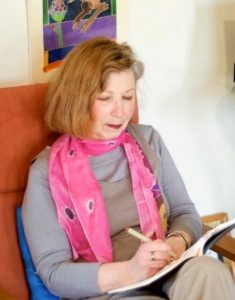 For example, at the end of the book, the author lists more of her own favorite collective nouns that she suggests her young readers can write about and illustrate, such as: a dazzle of zebras, a trip of goats, and a prickle of porcupines. 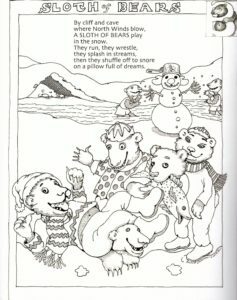 The last page is actually a “Wild and Crazy” mix and match page in which children can match the 10 collective nouns with the 10 animals illustrated in the coloring book. Cost: $15.00 includes signature & dedication. on a pillow full of dreams. You are currently browsing the Menupause weblog archives for February, 2017.